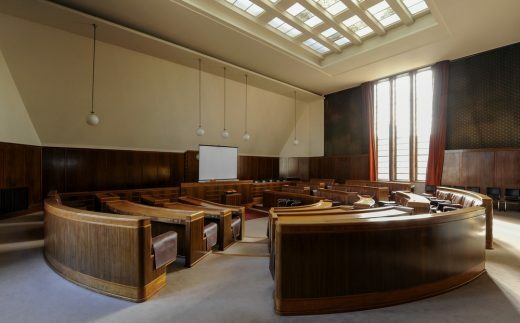 The restoration of the Grade II* Listed Hornsey Town Hall, the former civic headquarters in the heart of Crouch End, is set to go ahead following the completion of a development agreement between Far East Consortium and Haringey Council. 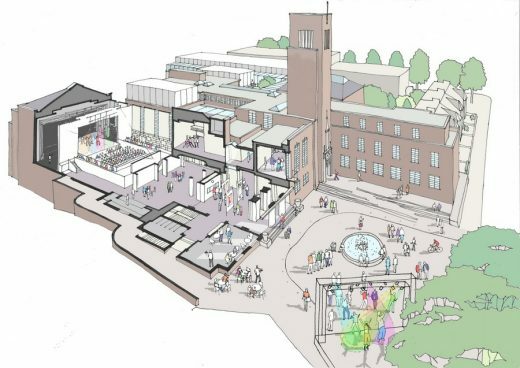 The restoration will deliver a range of community benefits including guaranteed access to the Town Hall and Town Hall Square, new jobs and a modern day, future proofed Arts Centre. 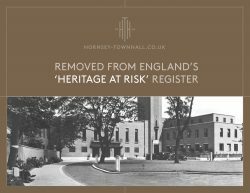 Undergoing meticulous restoration sympathetic to its history and significance within the community, the building will also be removed from Historic England’s ‘At Risk’ register, enabling Hornsey Town Hall to enter a new glorious period in its history. Headed up by Piers Read, The Time + Space Co. will be the new operator of the Town Hall, creating a modern day, future proofed Arts Centre for Crouch End and its surrounding areas. The investment will restore the Town Hall to its original condition, creating spaces fit for purpose as a sustainable arts centre. Running alongside the new homes, Time + Space Co will ensure the new Arts Centre is a creative hub, hosting world class performances and events, providing a centre in which people can work, socialise, relax and enjoy for many generations to come. Piers, a Crouch Ender himself, is exploring partnerships with many other local arts organisations and has already secured a partnership with Musion, the world leading 3D holographic projection producer, who will base its HQ at the Hall. Time + Space Co. has pledged to protect, harness and grow the cluster of creative businesses based onsite, ensuring existing businesses and freelancers can be accommodated within the new Hornsey Town Hall development. This will be possible through agile workspaces, which are flexible and affordable. Groups who use this space for training or practicing activities will benefit from the improved offering too. In line with the wider restoration of the building, the square will be rejuvenated to celebrate original features such as the iconic fountain and the period street lighting. The central green space is still home to the existing shady mature trees and lawn garden, while integrated seating will border the area and soft planting is set to bring bursts of colour. Lining the square, cafés and restaurants will serve al fresco diners as seating spills outside, and local traders and stall owners set up shop on market day, creating a vibrant, inclusive space for generations to come. 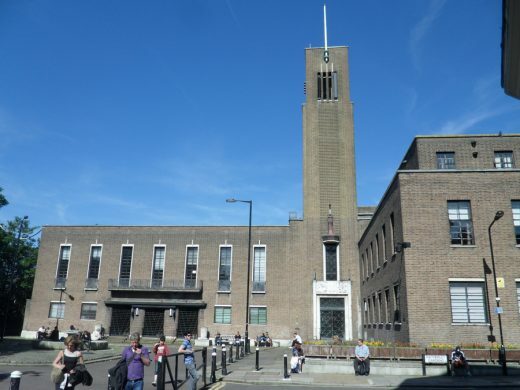 Hornsey Town Hall will remain an important part of the local community, hosting regular events, festivals and shows throughout the year. 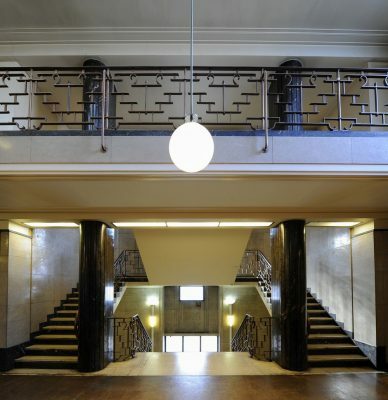 John Connolly, Head of UK Development at Far East Consortium, commented: “We are delighted to be working on Hornsey Town Hall, and understand that the pioneering, Art Deco building, is more than just a Modernist monument. It also has a proud history and a building much loved by the Crouch End community. Not only will Hornsey Town Hall undergo a physical transformation, but its place in local society will also be transformed. 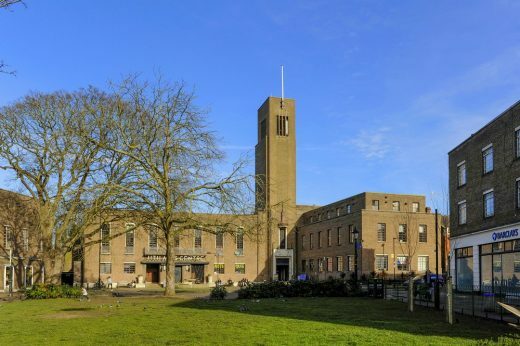 Exciting plans to restore the Grade II* Listed Hornsey Town Hall and secure its future for generations to come have been approved by Haringey Council. Leading development company, Far East Consortium (FEC) will undertake the multi-million pound restoration of the Town Hall, which will remove the landmark from Historic England’s ‘Heritage at Risk’ register and create a new destination in the heart of Crouch End. 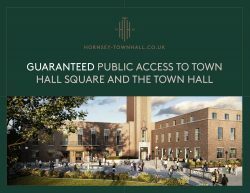 When restored, Hornsey Town Hall will feature a wide range of community spaces incorporating a new arts centre, café, flexible community and events spaces and a high quality hotel. The development will also include new 146 homes, providing studio, one, two and three bedroom apartments, 11 of which will be affordable. FEC will also create a newly landscaped Town Hall Square and a new public space named Town Hall Gardens. 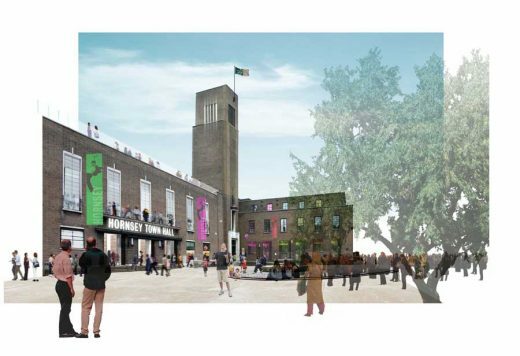 The arts centre will be operated by Haringey-based Time + Space Co, who will create a modern day, future-proofed arts centre for Crouch End and its surrounding areas. 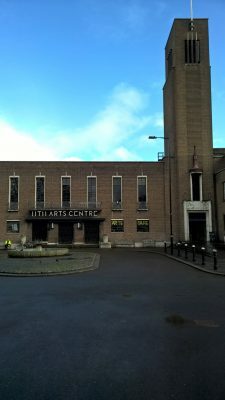 FEC will invest more than £30 million in the restoration and refurbishment of the Grade II* Listed Hornsey Town Hall and Grade II Listed Broadway Annexe – including more than £20million in essential repair and heritage works to preserve historic parts of the Town Hall including the council chamber. Planning approval follows years of community engagement, including through the Hornsey Town Hall Creative Trust, and months of discussions between the Haringey Council and Far East Consortium to deliver the best possible scheme for the site. Welcoming the news, John Connolly, Head of UK Development at Far East Consortium, said: “The team has worked tirelessly over the course of the year and have sought to reflect the views and interests of local people whilst at the same time ensuring our proposals are realistic and deliverable, which will secure the future of this iconic building in the heart of Crouch End. Cllr Alan Strickland, Haringey Council’s Cabinet Member for Housing, Regeneration and Planning, said: “We’ve said from the start that we want to see a sustainable scheme that restores and safeguards the architectural heritage of the Town Hall, offers local people access to this much-loved landmark and delivers long-term arts and culture for Crouch Enders and Londoners to enjoy. I’m delighted that we have approved a scheme that will do all that, while also bringing new social rented homes to the heart of Crouch End. The development will launch in 2018 and is expected to complete in 2020. Far East Consortium International Ltd (FEC) has appointed Make as architect for its latest project, Hornsey Town Hall, Crouch End. The award-winning architectural firm brings a wealth of expertise working on various heritage buildings across London and internationally. Working alongside Coplan Estates, FEC will undertake the restoration of the former Haringey Council offices, ensuring its removal from the risk register and securing its future for generations to come. When complete, Hornsey Town Hall will incorporate a new arts centre with community access, restaurants, cafés, a boutique hotel, new housing and landscaping. 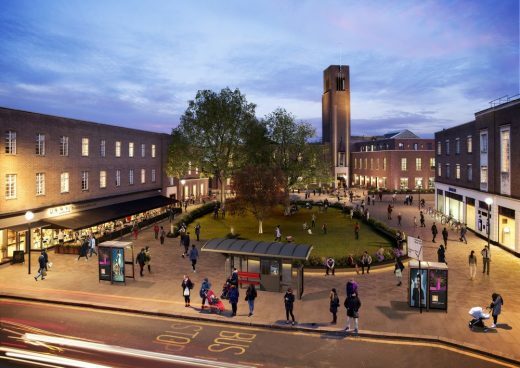 The Town Square and public realm will also be regenerated to incorporate parkland, seating and market stalls run by local businesses. The historic elements of the building will be restored, and many will be available for community use such as the assembly hall, foyer, council chamber, supper room and committee rooms. Other parts of the building will be incorporated into a new boutique hotel with associated F&B. A new residential building, situated to the rear of Hornsey Town Hall, will provide stylish new apartments, delivering much-needed housing to the local area. Hornsey Town Hall is steeped in history. 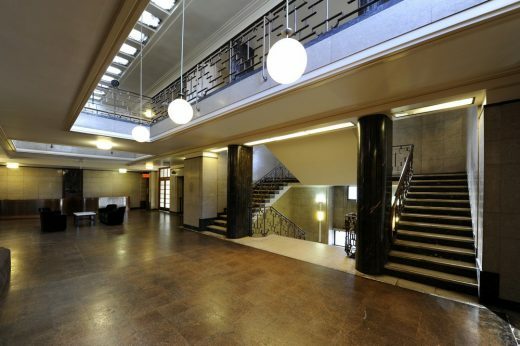 Designed in the modernist style by award-winning architect Reginald Uren, the building was completed in 1935. The building operated as council offices until 1966, when most of the council’s administrative services were moved to Wood Green. The building then fell into disrepair and recently has been used as an arts centre for the local community. The multi-million pound restoration of the historic Grade II*-listed building is set to commence in 2018, with a sales launch for the new residential properties scheduled for autumn 2017. Mountview Academy of Theatre Arts has announced today the appointment of RIBA award-winning architects Purcell to lead the design team for the redevelopment of the iconic Hornsey Town Hall in Crouch End. Today’s good news follows on from successfully securing initial support, including a development grant of £482,000, from the Heritage Lottery Fund (HLF) last year. Purcell has over six decades of experience, with an excellent record working on comparable heritage and arts projects, notably St Paul’s Cathedral, the National Maritime Museum and Theatre Royal Haymarket. Their work on the Florence Institute in Liverpool was awarded the RIBA North West Conservation Award and the Construction Heritage Award this year. This appointment comes as the result of a Europe-wide tender process (OJEU) ensuring best practice in the recruitment of design teams for major projects. The selection panel included representatives of Mountview’s Board and Haringey Council. The design team will be led by Mark Hammond, a Partner at Purcell, and includes Associate Architect Liz Smith who is a Crouch End resident. Also part of the team are structural engineers Ramboll, The Landscape Partnership and access consultant Access=Design. The appointment of Purcell is a key moment in this transformational project to refurbish a distinguished Grade II* listed building as a new home for Mountview and bring it back to life for arts, cultural and educational use.